So after reading YES' will several times and reflecting that our family maybe held up his hopes in item 3 if having failed him in most of item 2, I began leafing through the other chapters of the book. 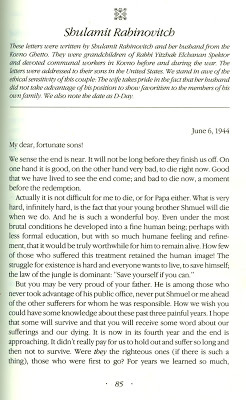 Imagine my surprise in finding as the last item in the Holocaust section the text of the letter written by Shmuel's mother Shulamit Rabinowitz from Kovno on June 6, 1944 to her two older children just days or hours before she expected to perish along with her husband Yitzhak and eight-year-old son Shmuel. 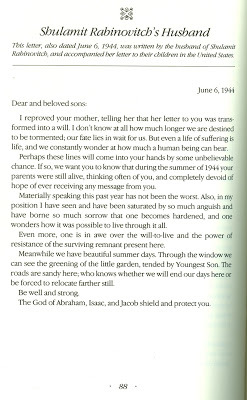 This letter (and a shorter one that follows by Shmuel's father Yitzhak Elhanan Rabinowitz) is incredibly moving. She remains proud, though she is accepting of her likely fate. Her biggest regret is that Shmuel (whom she calls by the pet name Muka) will have his life cut short. Beyond that, rather than summarize I will let you read for yourself. We know that in fact Shulamit, Yitzhak and Shmuel did not perish in Kovno. At this time, I do not know the full story of how they escaped and made their way to Palestine. I believe that Walter knows at least a short version of the story and perhaps he can fill us in. He may also follow up directly with Shmuel for more of the details. What I do know based on Shmuel's 1996 correspondence with Morris Spector is that Yitzhak Elchonan (he later dropped the Rabinowitz name) died in Tel Aviv in 1992, Shulamit died in March 1996 in Haifa, and that Shmuel is alive and well in Rehovot at age 78 with his wife Zippora. They have two sons Benjamin and Ofra. The two older sons to whom the letter was written both went to Israel as well. 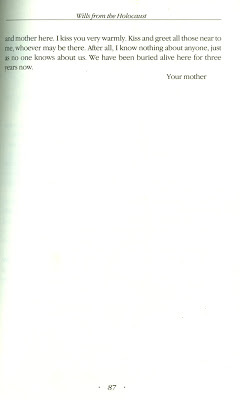 They were not in the United States when Shulamit wrote to them, but in Palestine. Benjamin was felled in the Israeli war of independence in 1948. Amos lived until 1965 and died in Tel Aviv of natural causes. By the way, Riemer's introduction to Shulamit's letter contains several errors. First, Shulamit became a Rabinowitz when she married Yitzhak, who was a great-grandson, not a grandson, of YES. Shulamit's last name was Rozenbloom before she married. 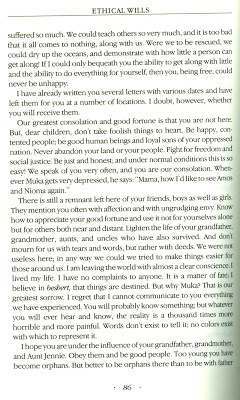 When she mentions "your grandfather, grandmother and Aunt Jennie" in the letter, those are Rozenbloom family members. I have just gotten off the phone with our wonderful relative in Rehovot, Shmuel Elchanan, who had informed me shortly before by e-mail of the passing of his beloved wife Zippora last December at the age of 76. As Shmuel explained, Zippora suffered a stroke at the Weizmann Institute where she had been a faculty member for 50 years while chairing a session at an International meeting on Photosynthesis, her subject of research for years. If I understood him correctly, she was rushed to the hospital and remained in a coma for five days before passing. Shmuel, whom I have never met face to face, but have had several extended phone conversations about our family history, is a wonderful man with I feel an instinctive kesher (connection). His warmth, understanding, deep empathy, primal Jew to Jew connection and sheer humanity amidst all the horrors he and our people have endured, is emblematic of what I have loved about Israel and Israelis all these decades; indeed, what keep my love for Israel unconditional though I have spent far too little time in Israel over the past decade and despite my disappointment with Israeli policies toward the Palestinians, etc. I am so sorry we never got to meet Zippora, who must also have been a wonderful person. Shmuel urges us to come to Rehovot to talk family history and we really should all do that as soon as possible. It is so moving to me that he is so connected to Rehovot and the Machon Weizmann which is of course where Jo, Danny and I spent that mind blowing life transforming year of 1961-62 as children, when our father Stan was there on sabbatical. Rehovot is a kind of lodestone for us and here it is again. In the meantime, Shmuel has agreed to a conference call with Dan and myself to help us to better understand many things, including that 'last letter' from his parents to his elder brothers of June 6, 1944, when they thought they and Shmuel himself were about to be liquidated by the Nazis. Kol hakavod (all honor) to Dan for getting hold of Ethical Wills and finding those letters as well as gthe last will and testament of our common ancestor Rabbi Isaac Elchanan Spektor. Thanks also to Moshe Spector and Jeff Spector for connecting with Dan and providing us with so much new information. Shmuel also mentioned a book by a well known Israeli writer, Hanoch Bartov, entitled "BEYOND THE HORIZON, ACROSS THE STREET" published in 2006, about our family. Apparently the book focuses on the stories of young men killed in the 1948 War of Independence, including one of Shmuel's older brothers, who had apparently served alongside Bar-Tov, It is unfortunately only in Hebrew which I read with great difficulty but I'm sure we will find a way to get the relevant sections translated. Tomorrow, July 27, I will finally make it to the Mt. Carmel Cemetery in Queens and, God willing, see the graves of Joseph Rabinowitz and Lena Lincoff Rabinowitz, our great grandparents.